MWC 2014: Samsung event points to Galaxy S5 launch | What Hi-Fi? 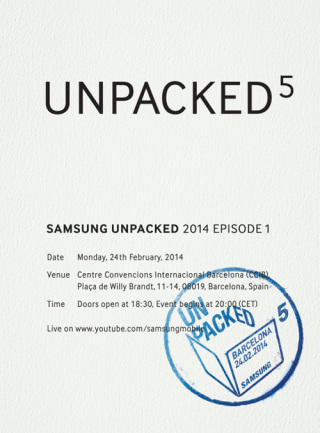 Samsung has sent out invitations to Episode 1 of its Unpacked 5 event, where it is expected to show off the new Samsung Galaxy S5. Unpacked 5 will be held in Barcelona on the 24th of February, the first day of MWC 2014 – although it is being held at a separate venue, eight miles away from the show. Second-guessing the smartphone or tablet that's set to be revealed based on the invitation is now par for the course, so while the '5' is rather obvious, the faux-leather look of the invitation could be deemed to contradict rumours of a metal design. The invitation follows mobile analyst Eldar Murtazin's prediction that the Galaxy S5 would be unveiled on the 23rd of February. The S5 is expected to come with a 2560 x 1440 2K display, Samsung's own quad-core Exynos 6 processor, 3GB of RAM and a 16-megapixel camera. Whatever Samsung is planning to unveil at its first event of the year, we have just under three weeks to find out. As ever, we'll be reporting on any new Samsung phones and tablets, and will be on the ground in Barcelona for Mobile World Congress and the Samsung Unpacked event.